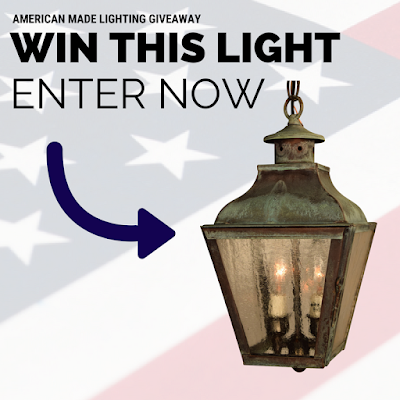 Outdoor Lighting Blog: American Made Lighting Giveaway: Which Would You Choose? 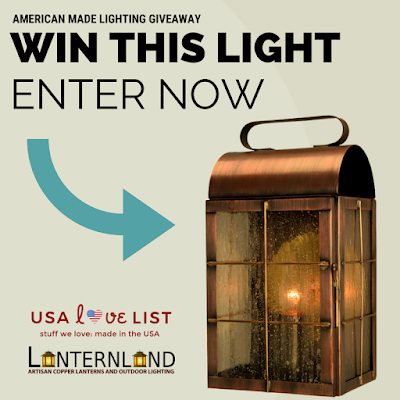 Lanternland is teaming up with our friends from USA Love List to giveaway one of our American Made lighting fixtures. 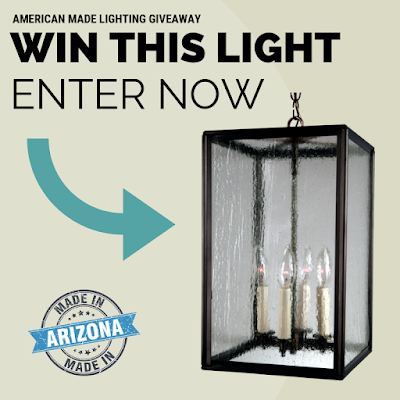 The winner will choose from one of three of our best-selling solid copper and brass lighting fixtures in their choice of finish and glass with a retail price of up to $400. This pendant style hanging lantern is created the old-fashioned way - handmade by talented artisans from sheets of raw copper and brass. Designed to last for decades and guaranteed for life, the solid brass and copper construction ensures that this lantern will never rust or corrode making it ideal for use in areas that get a lot of rain of snow. The Open Spaces Hanging Lantern is designed to reflect the wide open spaces of the American west. Indoors or outdoors, with or without glass, this versatile lantern made from solid copper and brass works equally well in both traditional and contemporary homes. Ideal home lighting choice for kitchen lighting in a series indoors over a kitchen island for a uniquely dramatic effect. Use as mudroom lighting, as a porch light or as an entry light for a more subtle, traditional copper lantern look. A perpetual best seller, the New Haven Colonial lantern is our most versatile rustic lighting fixture. Shown here in classic Verdi Green copper finish with Seedy glass the New Haven is will last decades without rusting or corroding. Handmade in the USA from solid copper and brass, this handcrafted copper lantern makes it easy to enhance your home's natural beauty while adding curb appeal and safety.